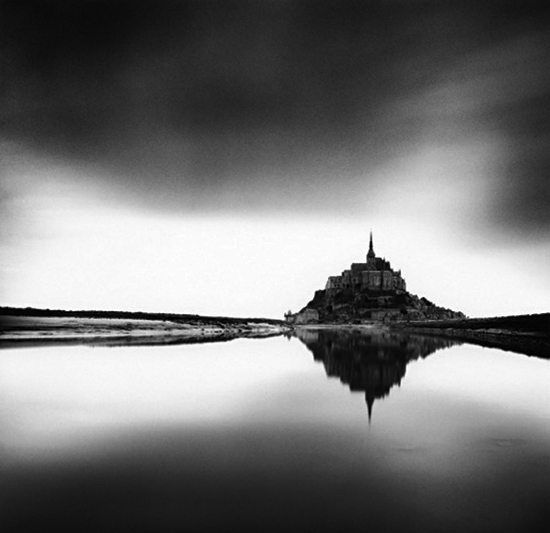 Michael Kenna, Midday Prayer, Mont St. Michel, France, 2004. Sepia-toned gelatin silver print, 7 1/4 x 7 1/2 inches. Courtesy of the artist and G. Gibson Gallery, Seattle. Michael Kenna has been capturing the ethereal essence of locations across the globe for more than 30 years. His unique point of view evokes a sense of calm that enhances the intimate connections of history and geography. The first US retrospective of internationally acclaimed photographer Michael Kenna’s photography in nearly 20 years, Memories and Meditations: A Retrospective of Michael Kenna’s Photography comes to Tacoma Art Museum from October 6, 2012 through March 24, 2013. The exhibition explores Kenna’s ongoing investigations of everything from the natural beauty of an island among Eastern countries to the haunting shadows of abandoned buildings in the midwest of the United States. Kenna is known to frequently return to certain locales in order to record them over the course of several years to capture the brilliance of time passing and memory. His wonder at the alchemy of printmaking translates into a wonderland of visual poetry. Memories and Meditations: A Retrospective of Michael Kenna’s Photography is funded by the Boeing Company, The Greater Tacoma Community Foundation and Tacoma Arts Commission.